Let's say you're in Austin, Texas, it's Sunday morning, and you go out for breakfast. What looks good on the menu? Chances are very good that you, like many of your fellow diners, will order migas. Migas (pronounced MEE gas) is a Tex-Mex tangle of eggs, bits of corn tortilla, and a host of savory ingredients, from black beans, chorizo and cheese to salsa, avocado and chiles. A dish that many professed egg-haters relish, it probably can thank its existence to thrifty cooks looking to use left-over tortillas, since tortillas are an integral part of the dish. The word, migas, in fact, is derived from the Spanish word for crumbs. Because they are an egg dish, they are traditionally served at breakfast or brunch. Like omlettes though, they can make an excellent dinner as well. The corn tortillas in migas can take the form of either fresh tortillas or tostados (tortilla chips), as reflected by our recipes. When tostados are used, they are added near the end of preparation so they retain their crispness. And, as you will see, fresh tortillas are added early on. These recipes are sized for two servings, but can easily be doubled or tripled or more for a larger crowd. Migas are a terrific brunch dish. In a skillet, over medium-low heat, sauté the bell pepper, onion and jalapeño for 2 minutes or until onion is transparent, but not brown. Stir in the black beans. Pour the egg mixture into the skillet, and "scramble" until eggs are almost done. Sprinkle in the broken tortilla chips, and stir well. Remove the skillet from heat, and sprinkle cheese into the eggs, again stirring well. Serve at once with additional salsa and warm flour tortillas, if desired. Makes 2 generous servings. Warm the butter and olive oil in a heavy skillet. Add the tortilla pieces and saut until softened. Add the chopped onion and sauté until it is transparent. Stir in the chopped green chiles. 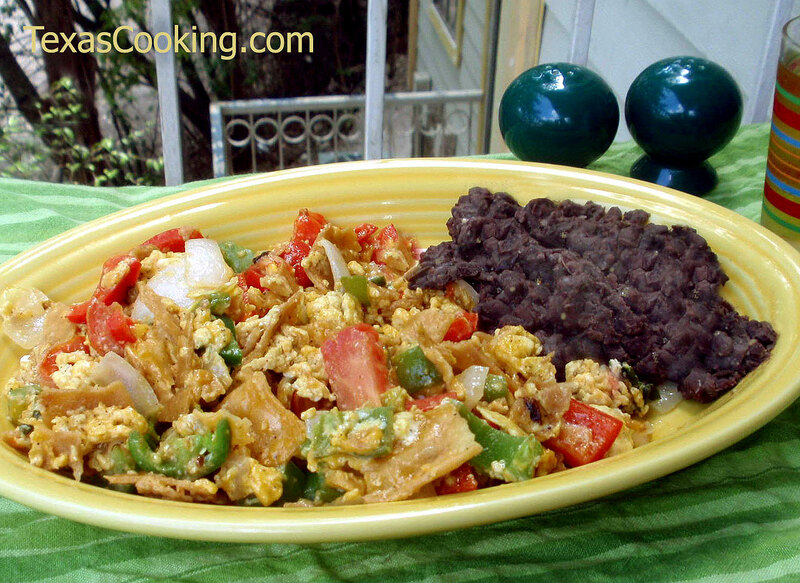 As long as your dish contains the requisite tortillas, you will still have migas. Of course, if you omit the tortillas, you'll still have a delicious, satisfying dish, but you won't have what they're eating in Austin.